I’m on a Mac Mavericks 10.9 using iMovie ’11, but it doesn’t recognize the .MTS movie files from my camera. What’s up with that? VLC player will play them but then I’m not able to edit the MTS in iMovie on Mavericks. Fortunately, I’ve worked out the best solution to importing MTS to iMovie program under Mavericks. Share with you now. >1. Connect the digital camcorder to the computer through the USB connection cable that came with the device. Double-click the “iMovie” application icon to launch it. >2. Click the “File” menu and select the “Import from Camera” option. >3. Click the “Camera” option and select “AVCHD” from the menu that appears. >4. Slide the “Automatic/Manual” slider to the “Manual” position and place a checkmark next to the videos that you want to import. >5. Click the “Import Checked” button to import the movies into the iMovie application. While, the point here is if you only have the single MTS video clips out of your AVCHD camcorder stored on hard drive for editing in iMovie, some problems would occur. As far as I know, currently there is no way to import single .mts files to iMovie that you have previously transferred from the camera to your computer unless you have used the Archive method which saves the whole file structure of the camera onto your computer. After multiple testing, an easy workaround I found is to converting MTS to Apple InterMediate Code on Mavericks for with working with iMovie flawlessly. First you need to download Acrok MTS/M2TS Converter for Mac, an easy-to-use yet powerful high-quality AVCHD (mts/m2ts/m2t) converter, player and editor. It is ideal for you to convert MTS files to iMovie 08/09/11 compatible format on Mavericks, Mountain Lion, Lion without loosing quality. With it, you can convert any video shooting in party or birthday with AVCHD camcorders to popular video format like MOV, AVI, WMV, MP4, FLV, etc. What’s more, the conversion is easy to handle and only with a few simple clicks, you can finish the conversion without facing any glitches. Download the program and you can edit MTS in iMovie smoothly as you wish. 1. Import MTS files Once run the MTS to iMovie Converter, you can click “Add Video” button (or “Add from folder”) to load MTS source files. Convert supports batch conversion, so you are allowed to add multiple files to convert at a time. 2. 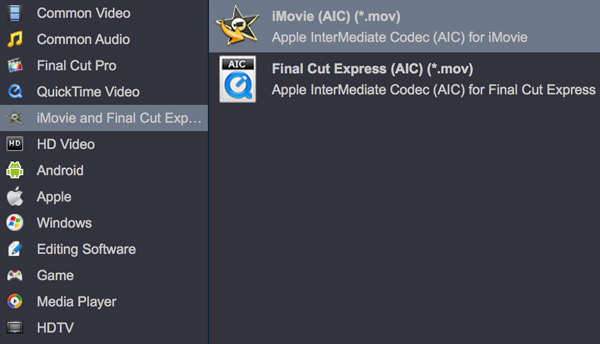 Select output format for iMovie Click the format bar, and move mouse cursor to “iMovie and Final Cut Express -> Apple InterMediate Codec (AIC) (*.mov)”. Click “Settings” button, then you will enter the following interface, on which you are allowed to customize size, bit rate, frame rate, sample rate, and audio channel to your required ones. 3. Start the conversion process Click the “Convert” button to start transcoding MTS to AIC MOV for iMovie. When the conversion is finished, you can click “Open” button to get the generated QuickTime AIC .mov files effortlessly. Afterwards, you can launch iMovie, and then choose File > Import > Movies to import converted MTS files in iMovie for further editing. Enjoy.